DAMOURS (d’Amours) DE CHAUFFOURS, LOUIS, Acadian seigneur, fur-trader and soldier; baptized 16 May 1655 at Quebec, eldest surviving son of Mathieu Damours* de Chauffours and Marie Marsolet; buried 9 May 1708 at Port-Royal (Annapolis Royal, N.S.). On 20 Sept. 1684 Louis Damours received a seigneurial grant in Acadia on the Richibucto river where he had built a fortified trading post and residence two years earlier. 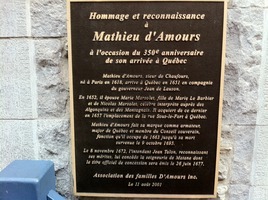 On 1 Oct. 1686 he married at Quebec Marguerite Guyon, daughter of Simon Guyon; her sister Louise* married his brother Mathieu Damours* de Freneuse in the same year. He and Marguerite had three children. On 7 October 1686, he obtained grants near Forts Jemseg and Nashwaak (Naxouat) on the Saint John River, previously issued to Pierre de Joybert* de Soulanges. He moved there with his family, presumably to be near two of his brothers, René Damours de Clignancour and Mathieu Damours de Freneuse, who had already settled on the Saint John. Later he had established a store, was pursuing the fur trade with the Indians, and farming his land. 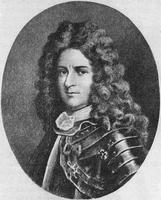 He and his brothers were severely criticized by Governor Robinau* de Villebon who claimed that they were disreputable and over fond of liquor, and that they had failed to improve their grants of land. Much the same charges were levelled by Villebon at other settlers and officials and it seems clear that there was an unfortunate atmosphere of intrigue, bickering, and trouble making which may have been sparked in part by Villebon’s own illegal involvement in the fur trade. In any case his treatment of the Damours brothers earned him the censure of the minister of Marine, Pontchartrain. In 1695 Louis Damours purchased John Gyles*, a captive of the Malecite Indians, whose published account of his experiences contains considerable information about the Saint John area of that period. In August 1696, Damours participated in the attack by a mixed Indian and French force led by Pierre Le Moyne d’Iberville and Jean-Vincent d’Abbadie de Saint-Castin on Fort William Henry at Pemaquid in New England. Damours commanded his own vessel in this expedition, and after the capture of Pemaquid he took the garrison to Boston. In October of that same year a New England force led by Hathorne made a raid along the Saint John. Although Damours was absent in France at the time, his buildings, crops, and livestock – constituting probably the largest farm of that time in the area – were spared thanks to a note from Gyles to the commander requesting that he do so. Gyles was later freed by Damours for this act of loyalty. Owing to damage caused to his property by a high freshet in 1701 and the decision of Governor de Brouillan [Monbeton] to abandon defences on the Saint John, Damours determined to move to Port-Royal. Brouillan appealed to the court for aid for Damours, as the latter was in serious financial straits. It was also about this time that his wife died. With France and England at war in Acadia once more, Damours joined the French forces and was taken prisoner in 1703. He spent slightly more than two years as a captive in Boston, returning to Port-Royal in 1706, where he died two years later. He was aptly termed by Brouillan “the mainstay of the inhabitants and the savages” during his years as a seigneur on the Saint John River. AN, Col., B, 16, ff.41–42; 19, f.37; C11D, 2, ff.244, 244v, 246, 277, 278; 3, ff.18, 157v; 4, ff.62, 144v, 214v, 323v; 5, ff.112, 282v; Section Outre-Mer, Dépôt des fortifications des colonies, carton 2, no.56. Coll. de manuscrits relatifs à la N.-F., I, 386; II, 96, 183, 190, 215, 302, 389, 390, 408, 455, 463. [John Gyles], Memoirs of odd adventures . . . ( Boston, 736; repr., Cincinnati, 1869). Jug. et délib., III, 399, 547, 555, 562, 783. A. Roy, Inv. greffes not., VII, 37. P.-G. Roy, Inv. concessions, IV, 2–3, 57; Inv. contrats de mariage, II, 120. Webster, Acadia. Tanguay, Dictionnaire, I, III. Azarie Couillard Després, Histoire des seigneurs de la Rivière-du-Sud et leurs alliés canadiens et acadiens (Saint-Hyacinthe, Qué., 1912), 108–11. W. O. Raymond, The River St John, its physical features, legends and history from 1604 to 1784, ed. J. C. Webster (Sackville, N.B., 1943). Ganong, “Historic sites in New Brunswick.” P.-G. Roy, “Mathieu Damours de Chauffours,” BRH XXXII (1926), 385–92. George MacBeath, “DAMOURS DE CHAUFFOURS, LOUIS,” in Dictionary of Canadian Biography, vol. 2, University of Toronto/Université Laval, 2003–, accessed April 24, 2019, http://www.biographi.ca/en/bio/damours_de_chauffours_louis_2E.html.